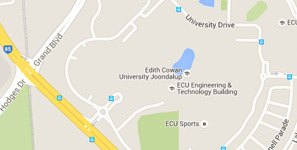 Copyright protected material on this site may be owned by Edith Cowan University, its individual staff or students, funding providers, contractors or other third parties. Unless otherwise stated, the exercise of any of the exclusive rights under the Copyright Act 1968 (Cth) ("Copyright Act") in relation to the material on this site is not permitted without the consent of the rights owner or as otherwise covered by a statutory license or exception to infringement under the Copyright Act. Requests to deal with copyright protected material owned by Edith Cowan University should be directed to copyright@ecu.edu.au. Unless otherwise explicitly stated, permission to deal with such material does not include permission to deal with Edith Cowan University trademarks. Any permission granted by the University to deal with copyright protected material does not extend to any material on this site belonging to a third party or individual staff members or students. Consent to deal with such material must be obtained from the copyright owners concerned. ECU takes its obligations under the Copyright Act seriously. If you believe dealings with your copyright protected material contained in this website constitute an infringement of your rights, please contact our Copyright Officer on copyright@ecu.edu.au.